Falmouth Haven Marina: As you head into the sheltered waters of the inner harbour, Falmouth Haven lies to the south west. Open to both visitors and residents, our marina is ideally situated in the heart of Falmouth with easy access to local shops, restaurants and other amenities. Berth holders benefit from full access to shoreside facilities as well as our free Wi-Fi. It is a perfect location for departing to or returning from transatlantic sailing adventures, as a cruising port en route to France, Ireland or the Isles of Scilly. 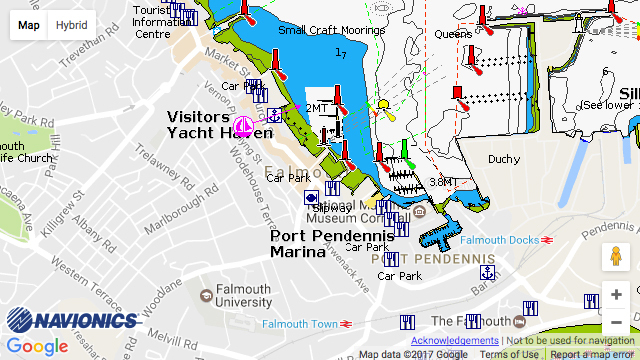 For further info contact Falmouth Haven on VHF Channel 12, 01326 310990 or email welcome@falmouthhaven.co.uk.